The footpath in the foreground leads from Little Hart Crag, over Bakestones Moss, towards Dove Crag, behind the viewer. The slope of High Hartsop Dodd is beyond it leading down to Hartsop Hall. It provides an alternative descent from Dove Crag in the Deepdale Round walk. The summit of Caudale Moor is at the extreme right of the picture. Two ridges cross the frame from it, the one in front, the northwest ridge, leads down to Sykeside and the Brotherswater Inn - just visible in the valley - and the one behind leads to Hartsop Dodd and down to Hartsop village. Behind this latter ridge is Gray Crag, the northern spur of Thornthwaite. 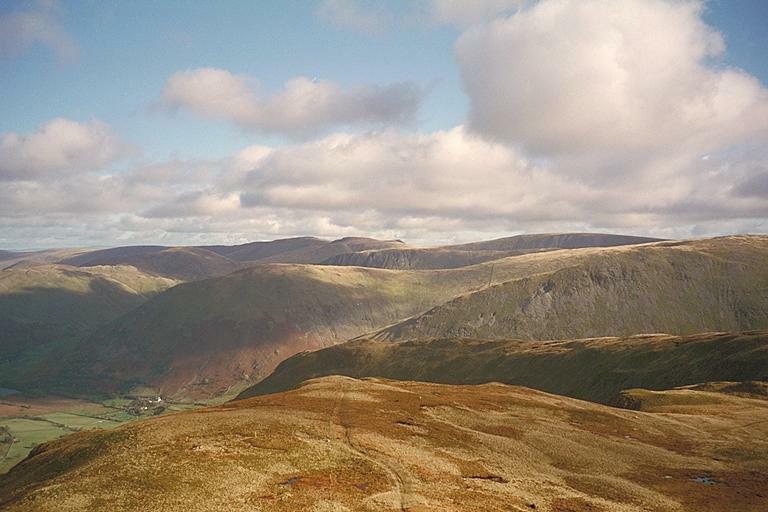 On the horizon, from the left, lie: Loadpot Hill, with Angletarn Pikes in front; Wether Hill and Rest Dodd which may or may not be seen in front of it, depending on your browser; High Raise; Rampsgill Head; Kidsty Pike; the gap of the Straits of Riggindale, and High Street. Smaller version of this picture.